Philip Steiner: After Oil - I'm published! After Oil - I'm published! 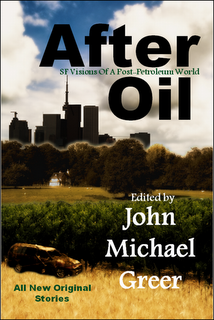 About a year ago, John Michael Greer, author of the Archdruid Report, challenged his readers to submit short stories envisioning life after the end of cheap petroleum, without descending into Mad Max apocalypse, nor relying on rescue by "alien space-bats." My short story "Traveling Show" was among the twelve that John selected, and I'm happy to report that the book is now in publication and available from Amazon in Kindle, Nook, Smashwords and good old dead trees formats. Many thanks to John for inspiring me to write a story, and to my fellow authors, without whom the book would not have been possible. Together we might part the mists to the kind of future where we'd like our children and descendants to live.